Recently my brother-in-law had a reverse osmosis system installed for their drinking water. The installer left him a water quality meter which is a digital TDS meter that measures the Total Dissolved Solids in the water. 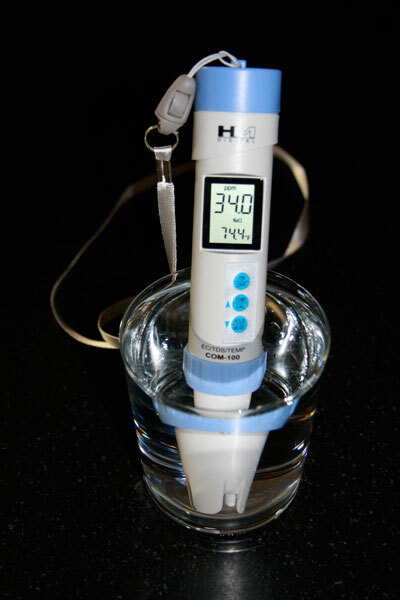 What this means is that it measures the total amount of substances in the water other than the pure H2O. He joked that this was the first time ever that he had a gadget that I didn’t… so to keep with my reputation, that night I ordered my very own TDS Meter. Today, the unit arrived and I checked our water quality… it’s 34.0 — which is good! My sisters water through reverse osmosis is 0.06 (really, really, good!) and their normal water was at 60. The ideal drinking water range is 0-50. I do have a simple water filter installed but when testing the water non-filtered I didn’t notice much difference (maybe it’s time to get a new one?). I highly recommend you check your water quality since the EPA Secondary Regulations advise a maximum contamination level (MCL) of 500mg/liter (500 parts per million (ppm)) for TDS… that’s really high if recommended drinking water is 0-50. So if there is a problem with your water supply you can get to it before it gets you… the unit I bought is the HM COM-100 ($65), but can get a lesser version for around $15.